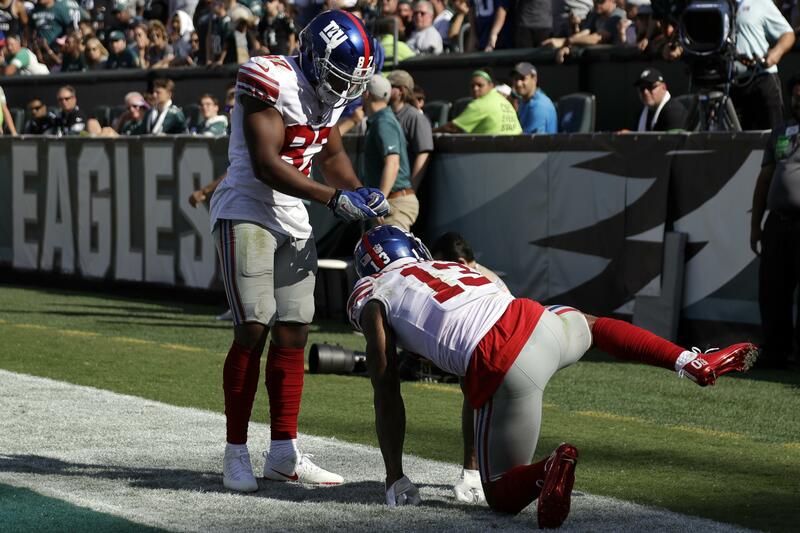 Fri., Sept. 29, 2017, 11:16 p.m.
NEW YORK – New York Giants wide receiver Odell Beckham Jr. has been fined $12,154 by the NFL for his dog-like touchdown celebration last Sunday. Beckham got down on all fours and pretended to urinate like a dog after catching a fourth-quarter touchdown pass in a loss to the Philadelphia Eagles. He was penalized for unsportsmanlike conduct for the celebration, and met a few days later with co-owner John Mara, who was unhappy with Beckham’s behavior. Also in that game, Eagles running back LeGarrette Blount was fined $9,115 for taunting. Jets rookie safety Jamal Adams and Minnesota cornerback Xavier Rhodes were docked the same amount for taunting. Seattle cornerback Richard Sherman was fined $12,154 for unnecessary roughness, while Denver’s Will Parks was docked $9,115, also for unnecessary roughness. Jets linebacker Darron Lee drew an $18,231 fine for a late hit on Miami quarterback Jay Cutler. Published: Sept. 29, 2017, 11:16 p.m.